South Africa go in search of revenge against New Zealand in Wellington on Saturday after the All Blacks' brilliant 32-12 Tri-Nations victory rocked the world champions in Auckland last weekend. In our latest Scrum Seven we sound a word of warning to the Springboks with seven potential comebacks that went badly awry. In pouring rain the first Test had comfortably gone the way of the All Blacks, 21-3, but the Lions showed signs of life heading into the second showdown in Wellington. The dirt-trackers, powered by Shane Williams' five tries, brought up a century of points for only the second time in the tourists' history against Manawatu in midweek. 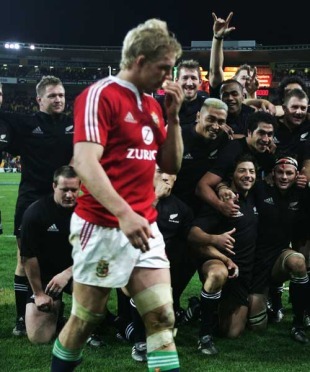 Williams started the second Test with his compatriot Gareth Thomas handed the captaincy after his predecessor, Brian O'Driscoll, had been speared out of the game in Christchurch. The move looked inspired as Thomas put the Lions ahead with a try inside two minutes but it would be an all-too-brief high. The tour had already been dogged by political infighting, a bloated playing staff and divisions in the camp, and the All Blacks heaped further woe on the Lions with Dan Carter bagging a 33-point haul including two tries, with others going to Tana Umaga, Richie McCaw and Sitiveni Sivivatu. There was a third Test too. Most Lions fans will struggle to place it. Back in 1969 tours to the southern hemisphere by Home Union sides were rare. Wales' summer sojourn to New Zealand was a prime opportunity for a side, one year out from that mythic 1970 mark in Welsh rugby, to test their mettle. Their mettle was well and truly tested with a 19-0 hammering in the first Test. The second, at the All Blacks' stronghold of Eden Park, provided the Welsh, who counted Gareth Edwards, Barry John, JPR Williams, Gerald Davies and Mervyn Davies among their starting XV, a chance to atone. Fergie McCormick, who would be tormented by John two years later as the Lions left New Zealand victorious, booted Wales out of the game, converting tries from Ian Kirkpatrick, George Skudder and Ian MacRae as well as slotting five penalties and a drop-goal. Harlequins' Heineken Cup season in 2008-09 ended with the damaging 'Bloodgate' affair and millions of shaking heads across the rugby world. Months earlier however the London club had been the darlings of the competition after securing back-to-back wins over Stade Francais. The French giants had packed out the Stade de France for the first game, which went the way of Quins 15-10 despite all the razzle dazzle Max Guazzini's Amex could muster, and were hell-bent on wrecking the party in torrential conditions at the Stoop. With Stade a point ahead thanks to a drop-goal from Juan Martin Hernandez, Quins twice moved the ball to Kiwi fly-half Nick Evans, whose two side-stepping bursts were pure genius, setting up a winning drop-goal after an incredible spell of pressure. Six years after their tremendous series win over the All Blacks the Lions returned, under the leadership of Welsh fly-half Phil Bennett. It was a difficult tour, but one that nevertheless produced a grandstand finish. Trailing 2-1 in the Test series after a 13-9 win in Christchurch and All Black triumphs in Wellington and Dunedin, the final game would decide the fate of the tourists. Scottish scrum-half Doug Morgan scored all of the Lions' points, a try, conversion and penalty, as they led 9-6 going into the dying moments, but heartbreak loomed large as Laurie Knight pounced for the hosts - sending the Lions home beaten and leaving their 1971 counterparts out in front. Or, Morne Steyn 31-19 New Zealand. The best example the Springboks can look to this weekend is the merciless manner in which they denied a spirited All Blacks' response to a 28-19 defeat in Bloemfontein. For once New Zealand's confidence was rocked and without Dan Carter to steady the ship, Steyn took centre stage. The fly-half mercilessly punished an undisciplined All Blacks display, kicking eight penalties and a conversion to go with his side's only try. The Boks weren't finished either, winning away from home in Hamilton to whitewash New Zealand and win the Tri-Nations. Wellington's recent finals record is a veritable tragedy. This result, secured thanks to two tries from Cantabs fullback Colin Slade and another from winger Sean Maitland, was their fourth consecutive fall at the final hurdle, and their fifth in six. To compound their woe, they had a chance in 2009 to bite back at Canterbury, who had beaten them the previous year at Westpac Stadium. In reality they shot themselves in the foot with a woeful first-half performance and were forced to watch their rivals waltz away with the goods, as they had done the preceding August when they relieved them of the Ranfurly Shield. England's march to the World Cup final in 2007 was powered by a potent combination of Australian scrum weakness and French nerves, and their final showdown against South Africa gave them a chance to leave a mark after a humbling 36-0 beating in the group stages. On that occasion the Springboks may as well have been playing a different sport to the English, so superior was the control and poise of scrum-half Fourie du Preez. The final was a subdued affair, decided by the boot of Percy Montgomery, but for an agonising minute England nearly had their revenge. Mark Cueto's 'try' was correctly disallowed for a foot in touch and South Africa continued in second gear to the title. England were also forced to bid farewell to Jason Robinson, a class apart even in defeat.